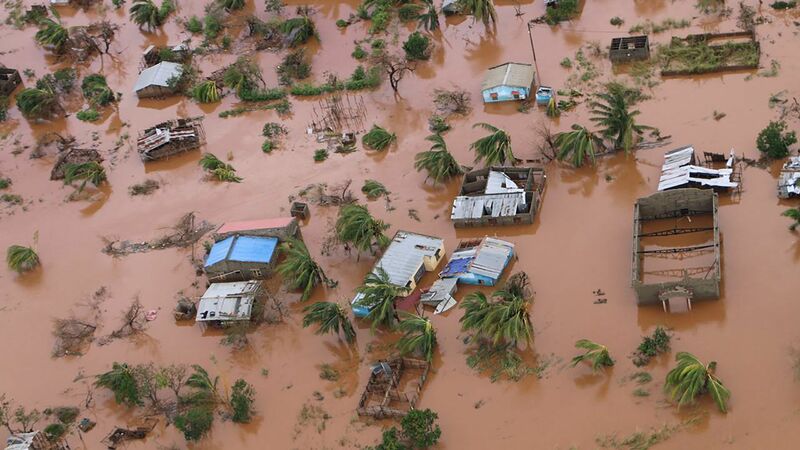 The mounting misery and destruction in the wake of Cyclone Idai, which roared into Mozambique on March 14 and 15, is becoming clearer — and more dire — as aid agencies struggle to assess the damage and deliver badly needed supplies to areas that are still submerged. Why it matters: With the official death toll in three countries — Mozambique, Zimbabwe and Malawi — climbing past 300 and potentially headed for 1,000 or more, Cyclone Idai could become one of the worst weather disasters ever to strike the Southern Hemisphere, according to the World Meteorological Organization. Torrential rains are continuing in parts of the three-country region on Thursday, as floodwaters slowly drain into the Indian Ocean. The big picture: According to the UN Humanitarian Office, "The situation is likely to deteriorate, and the number of people affected is likely to increase, as weather experts predict heavy rainfall" through March 21, with water levels potentially rising another 26 feet in some places. "There are also growing concerns regarding the potential effects of the overflow of the Marowanyati Dam in Zimbabwe on water levels in Mozambique," the office stated. Water-borne diseases are a major threat given the lack of clean drinking water in the storm's wake. Herve Verhoosel of the World Food Program said the floodwaters created "inland oceans extending for miles and miles in all directions," according to AP. The impacts: According to the Associated Press, bodies from Zimbabwe have been swept down mountainsides into Mozambique. "Some of the peasants in Mozambique were calling some of our people to say, 'We see bodies, we believe those bodies are coming from Zimbabwe,'" said July Moyo, a minister of local government. "Everyone is doubling, tripling, quadrupling whatever they were planning," said Caroline Haga of the Red Cross referring to aid, according to the AP. "It's much larger than anyone could ever anticipate." The bottom line: Mozambique occasionally gets struck by tropical cyclones, but few have been as intense as Idai. In this case, Cyclone Idai was able to intensify rapidly in between Madagascar and Mozambique due to light wind shear aloft and warm ocean waters. In addition to the storm's intensity and heavy rainfall, the biggest factor driving up the death toll is the vulnerability of the region — given the relatively poor population and weak infrastructure, which is unable to withstand powerful winds and prolonged, heavy rainfall.